Today is a great day because 1) it’s Sunday and that means my most ambitious goal of the day is to make it through lunch and then slide into “sieste” hour and 2) I’m thrilled to have another fabulous guest post from Sue Aitken. Sue is a fountain of knowledge when it comes to Provence, and today’s article on Arles is no exception. I hope you’ll enjoy a bit of “armchair travel” as we head out to discover another pretty little corner of the south of France. Arles is a great place to visit if you’re travelling around Provence. Rich in history, Arles is home to numerous ancient Roman monuments listed by UNESCO as world heritage sites. Its famous bullrings, known as Les Arènes, were built in the 1st century as the principal site of the Roman games, and are today home to La Féria, where thousands of devotees gather each year to watch the famous Corrida (bullfights). Also worth seeing in Arles are the ancient theatre, St Trophime church, the thermal baths of Constantin, and the Alyscamps – the exceptional ancient Roman necropolis just outside the old town. Arles is also famous for being the home of Vincent Van Gogh during part of his life. You can follow the footsteps of this renowned painter who settled in Arles in 1888 and where he painted over 200 canvasses, including the famous Sunflowers. Visit the Café Terrace on the Place du Forum where he painted one of his most well-known pieces, ‘Cafe Terrace at Night’. A Van Gogh centre has been created in the garden of the former Hôtel de Dieu – this site was the hospital to which the tortured artist admitted himself after cutting off part of his ear. With a range of excellent restaurants and bars and great shops, you should definitely consider including this city in any Provence itinerary. There’s also a huge weekly outdoor market on Saturday morning, and on the first Wednesday of every month there’s a “Foire à la brocante” (antique fair) on Bd. des Lices. As is the case all over Provence, best buys are colourful provencal fabrics (or indiennes), local pottery and of course santons – the traditional provencal figures made from clay. 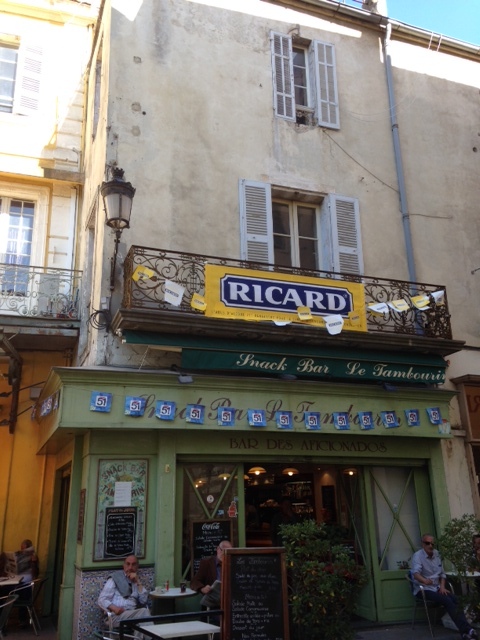 On my recent visit to Arles, I found a couple of restaurants definitely worth a visit. La Fee Gourmande on 3 rue Dulau is run by a very friendly couple and my main course of lamb that had been braised for 7 hours was absolutely delicious. 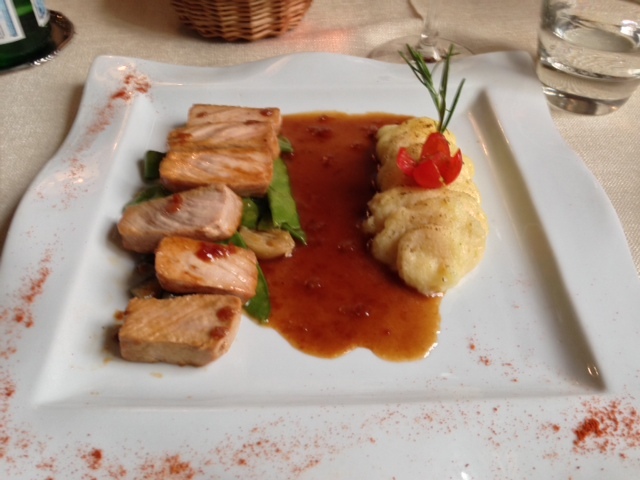 La Gueule du Loup on rue des arènes was my favourite though – situated in an old stone house in the old town, I had a fabulous lunch – the delicious pork dish shown below followed by a scrummy creme brûlée flavoured with fleur d’oranger. I think Arles is often overlooked by visitors to Provence, partly because it’s quite far west, and isn’t close to the beaches and seaside. 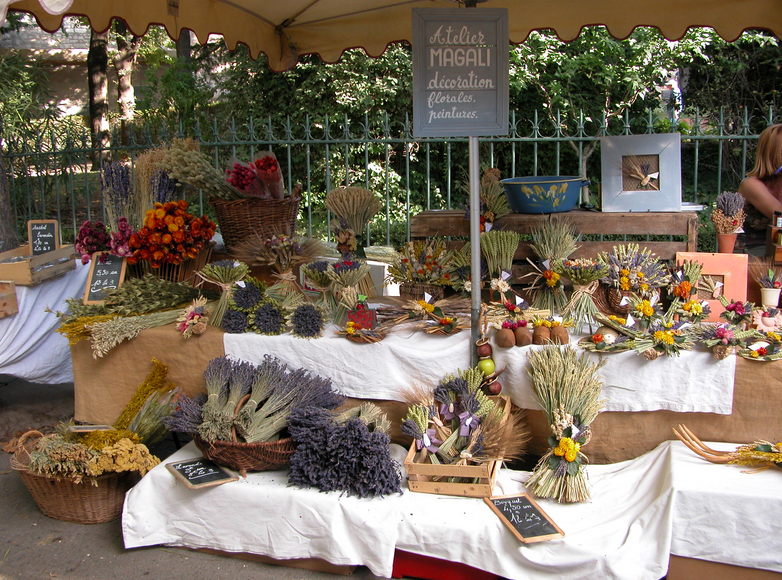 But I highly recommend a visit – it’s definitely a slice of authentic Provence. For my recent short trip I stayed at the 2 star logis – Hotel des Muettes on rue des suisses in a characterful stone building in the old town – very friendly people and perfectly adequate. If you visit Arles at the right time of year (June) and are travelling by car, you’ll be impressed by the approach into Arles from the North. The scenery is really spectacular with fields of fabulous sunflowers on either side of the road. Many thanks to Sue for her insightful post on Arles, merci! Thanks for your comment Gigi… too bad about the bus (!) but I do think Arles warrants a return trip… driving yourself might be a good way to explore, also to pop over to St Remy again! Arles is one of my favourite towns to visit as well. I can’t wait to get back there this summer and spend time wandering through the new Van Gogh Centre. Thanks for this informative post! I went to Arles for the first time just a year ago, with a friend who lives in Aix. Yes, I loved it much more than expected….and definitely want to return! We went on to the Camargue which was also just spectacular. Thank you for this great post, and the links which I will bookmark! Lucky you Libby, I haven’t been to the Camargue yet but it’s high on the list… heard there is some stunning natural scenery… not to mention I’d love to get a peek at the wild horses 🙂 Thanks so much for your comment!